Love is a free gift. God does not force us. God does not impose anything on us. He only invites and proposes. One of Fr. Josh’s parishioners had a family member who was bitten by a mosquito and became very ill. She prayed over him with a relic of Blessed Francis Xavier Seelos and asked him to intercede. A few days later her extremely ill family member was sitting up in bed! I am a fairly new listener to the Podcast and I am really enjoying it! I appreciate your balance lightheartedness and seriousness as you navigate the Faith for us! My question for you today is about children at Mass. My husband and I have two boys (under two years old…pray for us!). Our oldest is not quite two but I feel like he is fairly consistent at Mass – meltdowns occur of course but we can always make it through Mass. I try not to have high expectations for him due to his age but he is very reverent for being so young. We recently tried sitting in the pews at Mass (as opposed to the cry-room). Although we made it through Mass, it wasn’t for frequent snacks, many shh’s, and high irritation on my part. We have not tried our parish’s children’s nursery yet but it is a resource for us. Am I being selfish for wanting to place my oldest in the nursery for an hour so I can actually listen and participate in Mass? Should we keep trying in the pews? I also don’t want to distract other parishioners as they try to worship as well! As a priest, how do you feel about children in Mass? What are your ideas for us? I feel like it is a weekly argument between my husband and I – I want to try the parish nursery and he wants to worship as a family. I appreciate his perspective and I feel selfish for wanting to “get something” out of Mass as well. In contrast to my husband, I am not a cradle Catholic (this could be why we differ on the subject)! Should I just go on my own after we worship as a family? What are your views on Halloween costumes and dressing up? I have many family and friends no longer allowing their children to participate due to their Pastor announcing that the church members should not participate. I feel it’s such an playful and fun holiday bringing families in the community together. So in my heart I don’t see anything wrong with it. Children at Mass – Do what you have to do to worship the Father but recognized that kids crying at Mass can help us go deeper into the sacrifice. The children can bring us back to Calvary. Maid of Honor – Make sure you pick someone who will support your sacrament. Halloween – History matters! Learn history and study Church history and everything else makes sense. While Fr. Josh was raised Catholic, he didn’t like the Church growing up. One day, in adoration, he fell in love with Jesus and received the call to become a priest. 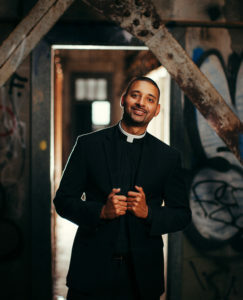 Now, Fr.Josh is the pastor for Our Lady of the Holy Rosary Catholic Church in Louisiana, and he is a presenter in two of Ascension’s programs: Altaration, and YOU: Life, Love, and the Theology of the Body. Hi! I’m catching up on several of your podcasts so I apologize that I’m late in commenting. I wanted to give Kirsten Pena hopefully some encouragement concerning the kids at mass. No doubt it’s difficult when the children are restless in mass. However, if they don’t sit with you as a family, they may not properly learn how to conduct themselves in mass. My priest (Fr. Mark Derise, Sts Peter and Paul in Scott, LA) absolutely LOVES kids in mass, like Fr. Josh, and he says he enjoys the cries because it tells him that the congregation is growing and how wonderful that is! But there are some priests that don’t feel that way and I’ve been witness to a few priests commenting at the end of mass about the crying babies and not in a positive or welcoming way. I don’t mean to judge but I thought that was unnecessary and I fear it might drive some families away. In any case, maybe try to continue sitting together in mass and use the cry room for those times when the children are sick or something out of the ordinary is causing them issue. As parents, we have to teach our kids the right way, no matter how difficult it is. It will definitely be worth it in the long run. Good Luck and many prayers!! distracted by so many other people around us.